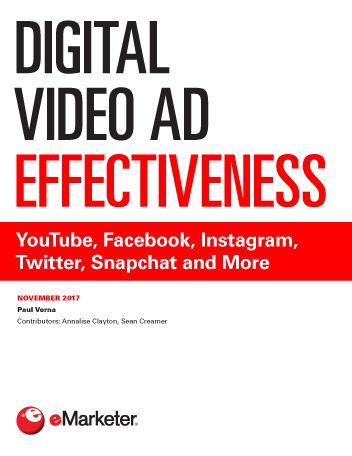 This report looks at how ad industry executives measure the effectiveness of video ad campaigns. As new platforms and devices change the landscape, and best practices must be tweaked, experts grapple with how to benchmark campaigns for maximum effectiveness. The report combines recent data with executive insights. YouTube and Facebook are the pillars of digital video advertising, with most practitioners using both rather than choosing one or the other. If anything, the question is how to combine each of those platforms with TV, not how to play them against each other. Twitter is another key outlet, but for many ad buyers the platform has not delivered on its promise. Snapchat remains an experimental option for most. As buyers increasingly delve into connected TV, they’re finding that the living room is a natural conduit for the types of ads that have worked for generations on linear TV. After all, connected TV viewers are still watching on TV screens, and the experience is similar to linear TV. But perhaps more importantly, the data-mining capabilities of set-top boxes and smart TVs present tantalizing possibilities. "US digital video ad spending will grow at double-digit annual rates for at least the next four years, surpassing $22 billion in 2021." How Do You Choose Between TV and Digital Video? What’s Stopping Digital Video Ads from Being More Effective?